Volunteers gathered at the Ouray Visitor’s Center last Saturday to learn how to identify and get rid of noxious weeds. Ouray County Weed Manager Ron Mabry led the day’s expedition as volunteers looked for: Chinese clematis, myrtle spurge, and absinth wormwood. Our group walked down the east side of the Uncompahgre River Walk spotting and removing the weeds. Additional weeds found included oxeye daisy, common burdock, and Scotch thistle. The volunteers worked hard until noon when we decided to stop for lunch; and just in time too! By the time we got our picnic unpacked it started to rain, lucky for us a volunteer secured a picnic table under an awning were we could eat, talk, and watch the storm roll in. Thank you to Ron Mabry for lunch! Absinth Wormwood is native to Eurasia, the Middle East, and North Africa. It was introduced to North America in the early 19th century for medicinal use. Hand pulling or dig when the soil is moist and make sure to pull all of the roots. 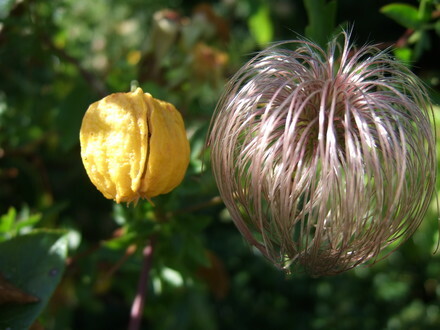 Chinese Clematis is a non-native herbaceous to wood perennial. It is a deciduous climber, and harms native vegetation and trees by out-competing it for space. It will completely cover walls, trees, bushes, and fences. The juice of freshly crushed stems and leaves cause blisters. Colorado native clematis has white flowers. Myrtle spurge is an invasive ornamental native to Eurasia. It’s popular in xeriscapes and rock gardens, however it rapidly escapes gardens and invades sensitive ecosystems, out-competing native vegetation and reducing wildlife forage. Myrtle spurge can be removed by hand pulling. Make sure gloves are worn to protect yourself from the toxic milky sap. 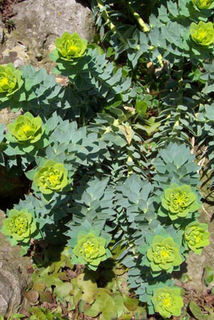 Alternatives to Myrtle Spurge for Colorado gardens are sulphur flower, kinnikinnick or creeping mahonia. Oxeye Daisy is an escaped ornamental which aggressively out-competes native vegetation in our rangelands. Oxeye daisy infestations reduces the carrying capacity of pastures when cattle are the primary grazers. The root system of the Oxeye Daisy is shallow and hand pulling is an effective method when infestations are small. Mabry, Ron. (1st Edition). Priority Weeds of Western Colorado.